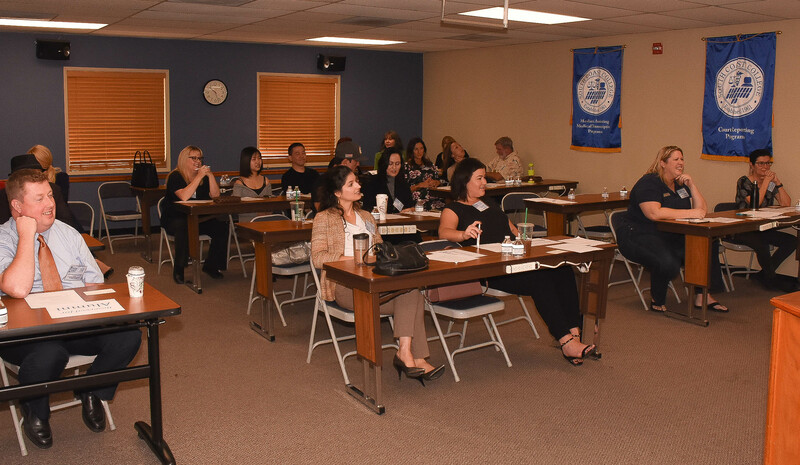 South Coast College in Orange, California, brought together alumni, students, agency owners, court representatives, employers, representatives from professional organizations, and community members to engage in an event called Pack the School on December 9, 2017. The event consisted of speakers on behalf of the Medical assistant, Paralegal, and Court reporting programs and an alumni panel with over 25 alumni speakers. Some alumni before the Pack the School Alumni Panel. Before the Pack the School Alumni Panel, a number of the alumni panel wrote testimonials that they provided for South Coast College to share with students who may be thinking about entering any of the three programs offered by South Coast College. My name is Jonathan Rodriguez and I am a Medical Assistant graduate from South Coast College. I graduated in 2017, and before I graduated, I was already placed in a spot that was going to hire me. Now, imagine that, graduating knowing that you already have the start of your career before even getting your certificate? My experience with South Coast College was amazing. I met a lot of nice and motivating people and great classmates. My favorite part of the program was the fact that everyone gets along so well and are always eager to help students succeed. I now work for a specialty doctor in Gastroenterology; the name of the office is Gastrointestinal & Liver Consultants. This office has treated me so well and has created a stress-free work environment. I can honestly say that I can see myself and the office expanding in the future. Thank you, South Coast College, for the opportunity to expand my education. I started court reporting school in 1987 at the age of 34 – graduated in December 1990 at 38. It is the best career decision I have made. I became a freelance reporter for Sarnoff Court Reporters in LA. I reported for five years and then was given the opportunity to do sales. Cory Sarnoff had sold his agency to Esquire at that time. After one year of sales, I was given the opportunity to be the General Manager for Esquire LA. I could go on and on, but I won’t. I loved being a freelance court reporter because it gave me the flexibility to choose the days I worked, and it gave me a great exposure to the litigation world. I highly recommend this career and would love to speak to any students or prospective students that are interested. When I was 18, I had no idea what I wanted to be, so I went to Cal State University for business. I dropped out after the first year and then went to fashion design school where I received my BA in Fashion Design. This was a horrible degree, to where I couldn’t find a job and ended up moving back home to my parents’ house. I was researching online and read that the legal field is a lucrative career choice. This was during the time the economy was downm and jobs were hard to obtain. I started at South Coast in 2010 in the Legal Admin course. I received my certificate six months later and found a job weeks later at a law firm. While working in the legal field, I wanted to challenge myself further so in 2013, I came back to South Coast College and received my AA in Paralegal. I love being a paralegal. I didn’t really find my passion, being a paralegal, until I was in my late 20s. It’s never too late to change your career. I can say with 100 percent certainty that I love waking up in the morning and going to work. My job is so fulfilling, and I am so happy to have received my education at South Coast. South Coast gave me the encouragement and tools I needed to graduate and become successful. Because of the knowledge and skills they taught me, I was hired as a paralegal while still in school. After I graduated, I was promoted to Senior Paralegal and head of the paralegal/support staff department. South Coast gave me exactly what I needed to become successful. Thank you, guys, so much. I started my journey at South Coast College in May 2012. But after working very hard towards my goal of being a court reporter, I stopped in January to pursue my career as a Scopist. I love being a Scopist. If it weren’t for my former classmate, Lisa Trow, I wouldn’t be on my new journey. Have I said how much I love being a Scopist? Having attended South Coast College has changed my life for the better, forever. I love my growing business in scoping. I love giving others another path to choose within this dynamic industry. I love teaching. Most importantly, I love the relationships I have formed that will last a lifetime. Thank you, Ms. Jean! I love my life! I started school with no expectations and found it to be the most challenging, yet rewarding, experience of my life. The teachers’ one-on-one support helped me to get through. This career has given me the freedom and the finances to do everything I’ve dreamed. In two years, I’ve been able to have financial independence; and travel, meet new people, learn new things, and the relationships I have made in this field will last me a lifetime. South Coast College gave me the tools and education to be a successful court reporter. I love being a freelance court reporter because it allows me to create my own schedule and still allows me to have a beautiful and fulfilling life. It’s a lot of hard work, but so worth it in the end. I attended South Coast College in the late 90s. I’ve been reporting for 15 years. I freelance for over 40 agencies. I love the flexibility and ability to be my own boss. I loved how South Coast prepared students for the state test. I freelanced for six months – loved the flexibility of depos. Now I work with LA Superior Court in criminal court. I love witnessing trials and interesting people of LA County. I came to South Coast College thinking I would just take some classes, get a certificate, and get a job that paid more. I left South Coast College with more than I ever could have imagined — having teachers/instructors that left imprints on my life. The experience at this school was so amazing. Never once did I fail due to the incredible heart these instructors and staff have for all the students. I didn’t just get a job. I landed a career that I love that has changed my life. This field is incredible, and thanks to South Coast College, I am right where I want to be in life with room to grow even more. Thank you for this incredible foundation that you offer all who show up and do the work! I graduated from SCCCR in 2002 and have worked in the field ever since! I am so proud to be an alumna, and I still believe that South Coast provides the best education around. Not only was my time at the college wonderful, but the South Coast team is still an active part of my life. I work now as a case manager and recruiter for Esquire Deposition Solutions, and I’m proud to help promote the future reporters in our industry. I became a court reporter in 2004 and found a full-time job immediately. I worked as much as I wanted, acquiring tons of experience along the way. I felt completely prepared, thanks to South Coast College, and I owe them all my success. The greatest part of this job is the flexibility. You can work as much or as little as you want. This flexibility became incredibly invaluable when I had a baby who was very sick — in and out of the hospital for a year and a half. I’m pretty sure that if I had a regular “job,” I would have been fired so many times. Other than the flexibility, my other favorite parts of this career are how much I learn every single day and how much earning capacity there is. Six figures almost straight out of school made it all worth it! I would not be where I am today without the support and guidance of South Coast College. I walked into the doors knowing nothing about the world of court reporting and left with the confidence to start this amazing career. Court reporting allows me the flexibility and independence to work when I choose and to have the financial freedom that most 30-year-olds will never achieve in the same time frame. I tell everyone I meet that I made the best decision when I decided to go to South Coast College and become a court reporter. This profession will truly change your life! Pack the School Event at South Coast College. What a great turnout! I feel honored to have been asked to speak on the panel. If anyone is interested in learning about court reporting, this is the best school out there. My sister and I both graduated from there.